A Wood Fence is still the most popular of fences. It offers a natural beauty to enhance your valued property while increasing security, containment, plus landscape protection from deer. 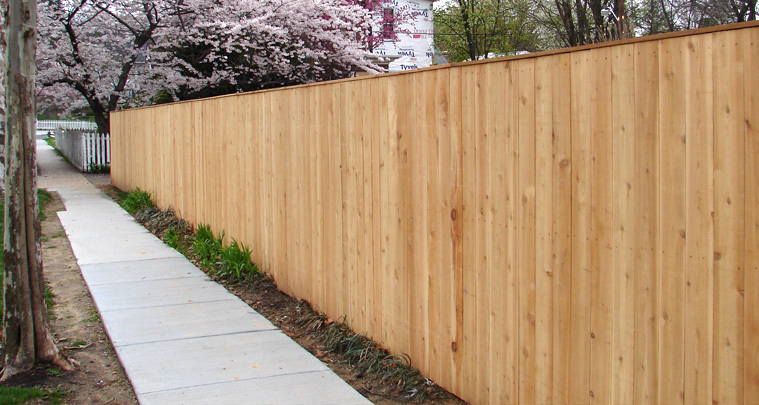 For most privacy, picket and estate fencing, our preferred choice of board lumber is Western Red Cedar. Cedar is naturally resistant to decay and insect damage and is a very stable board which seldom warps, shrinks, twists or swells in outside weather conditions. Cedar naturally turns to a nice silvery gray but is also extremely accepting of paint and stains which will increase the life of any fence. We offer pressure treated pine that is chemically treated with MCA (Micronized Copper Azole). This treatment is the most widely used method today and increases the life of the wood substantially, both above and below ground level (posts). Above ground level retention for MCA is .06 and ground contact is .15. We always use the pressure treated for all of our posts with the exception of Split Rail fencing, in which we use the much preferred dense locust post. Other choices of wood we use are #1 Spruce for Stockade, Oak for strength for Horse Paddock fencing and also Hemlock Rails for Split Rail fencing. Privacy fencing is an excellent choice of fencing for many reasons, such as added security or divider from busy roads and sounds, child and pet containment, keeping deer and other animals out, etc.. If you have a swimming pool, a privacy fence can be built to meet local regulations, while allowing homeowners to enjoy family time without disturbance. Last, maybe your neighbors simply are not so neighborly, then the privacy fence is an extremely good choice! Privacy fencing comes in a wide variety of choices to accommodate your needs and have numerous variations and accents to choose from. Your Capital Fence Sales Professional can help in identifying the style that best suits your personal needs and aesthetic. Space Picket fencing is an excellent choice of fencing for containment while also creating a semi-private environment and is appealing to the eye without feeling closed in. 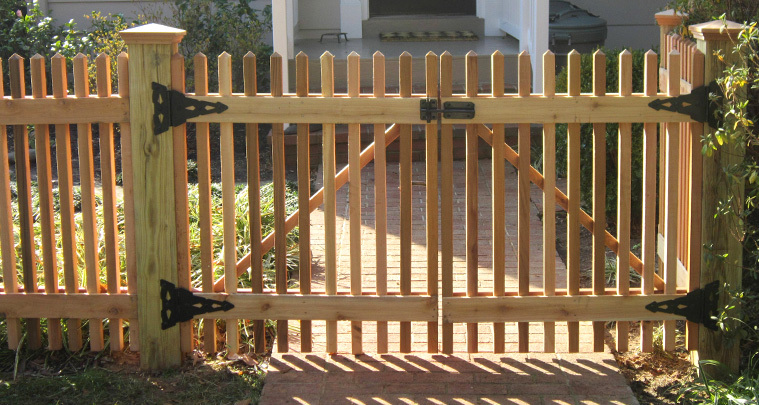 The space picket is the #1 choice for front yard fencing and also allows wind to pass freely through the fence. 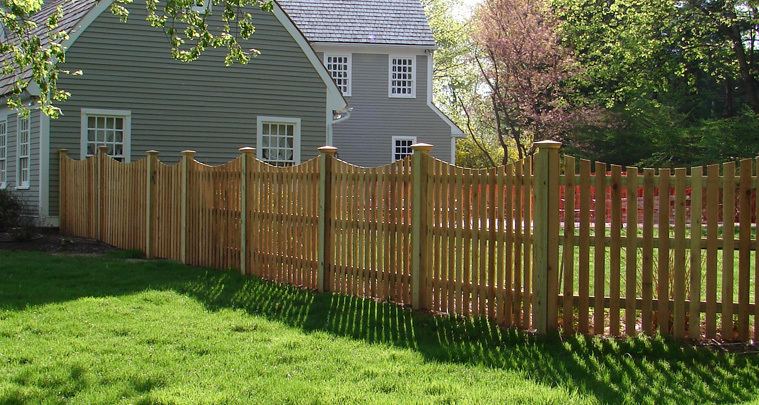 Western Red Cedar is Capital Fence’s preferred board choice for picket fencing due to its stability (does not warp or twist). We offer a variety of picket cuts, while Space Picket with a Mt. 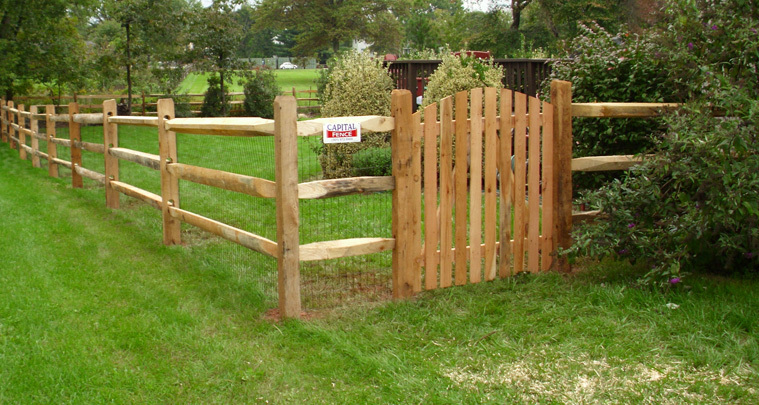 Vernon Dip is one of our most popular fences, the Space Picket with a Special Cut is also very well liked. You have options when it comes to figuring out your Space Picket style, Colonial, Colonial Gothic, Dog Ear, Spade and for the 2×2 pickets style we typically do pyramid cut. Your Capital Fence sales professional can show you pictures and/or samples of these choices to achieve the look you desire. If you are trying to achieve a fenced in yard or paddock with an open feel, Capital Fence offers two excellent options of fence style. Split Rail with a more rustic look and Paddock- Estate Fencing for a nice contemporary look. Both give you the benefit of being able to look out over your property while being functional in keeping children and pets safe if you add wire mesh to the fence. Split Rail fencing provides a rustic look while offering a feeling of openness. Split Rail comes in four different heights. Two Rail for 3’ high, Three Rail for 4’ high, Four Rail for 5’ high and Five Rail for 6’ high. Split Rail is excellent for spacious backyard lots and for containment of children and pets when wire is attached. Capital Fence only uses the finest materials for Split Rail. While most of our competitors use the pressure treated soft pine, we at Capital Fence still use the preferred combination of Locust Posts and Hemlock Rails for the wood and normally we use black coated vinyl over galvanized wire mesh. Mesh sizes are typically 2×4” opening size but we also use 1×2” to comply with pool code regulations. Ask your Capital Fence Sales Representative for further pool code requirements. Paddock-Estate style fencing provides a feeling of openness with a nice contemporary look achieved by using horizontal flat boards. 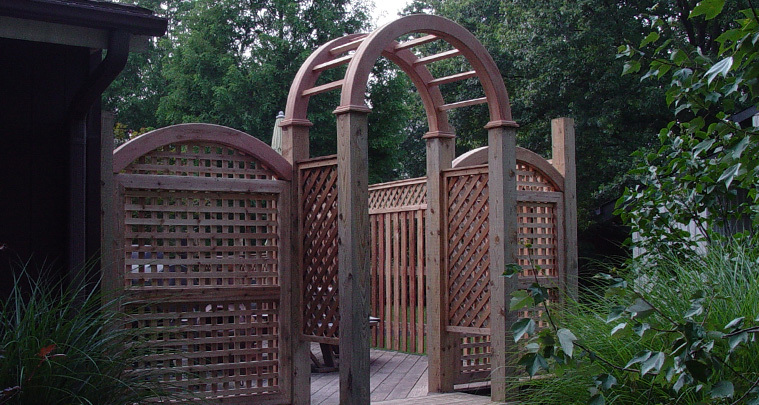 Western Red Cedar (¾ inches thick) is Capital Fence’s wood of choice for this style fence due to its stability. Cedar does not warp and twist like pressure treated pine tends to when used in the Paddock-Estate style of fence. Posts are spaced 8 feet apart and the boards have no supports in between, which makes the pine boards more susceptible to warping. 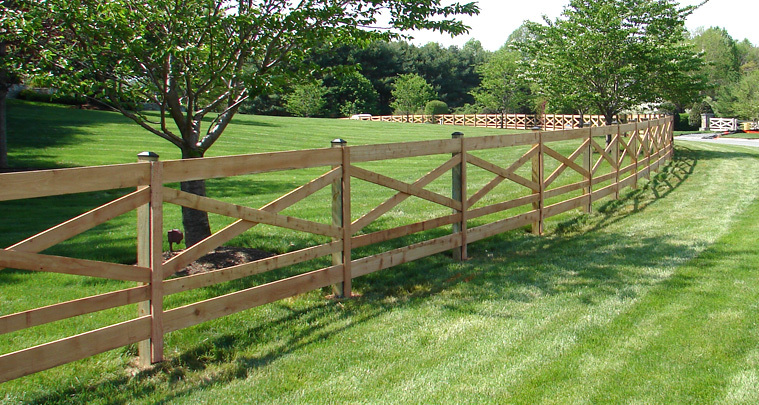 The Paddock Fence style is typically a three, four or five board design and the Estate Fence style has the two board Criss-Cross design as well as the horizontal boards. Most Estate Fence styles are four, five or six board design and typically use a combination of 1x6x8 and 1x4x8 boards. Wire mesh can be attached for containment and is available in black vinyl coated or galvanized. Capital Fence builds each fence board by board with the exception of Stockade, which comes in pre-fabricated panels. We also are able to build custom fencing, Gates, Lattice, Arbors and Trellises to meet our customer’s needs for their particular project. We use only quality materials for your custom fence installations. We can take any of these materials and customize them to fit your vision for your fence project. Our sales staff can offer you their experiences in what can and cannot work, ideas to improve your vision, and unique ideas from other projects they have done. Our sales team has over 25 years of experience in custom designing fences to meet your demands. Please consult your Sales Representative for more information and to review your design ideas.